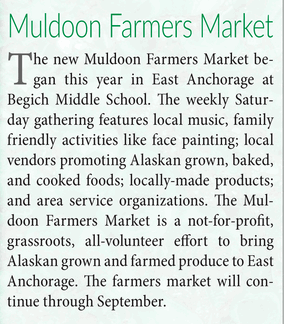 Jamie Lang wins Opening Day door prize at Muldoon Farmers Market – $25 in market coupons to spend with any vendor, any Saturday through September 23 at Muldoon Farmers Market, at Begich Middle School. Weekly drawings. Jamie, a regular shopper, and happy pup head home after shopping for greens at Muldoon Farmers Market. This entry was posted in event and tagged door prize, opening. Bookmark the permalink.